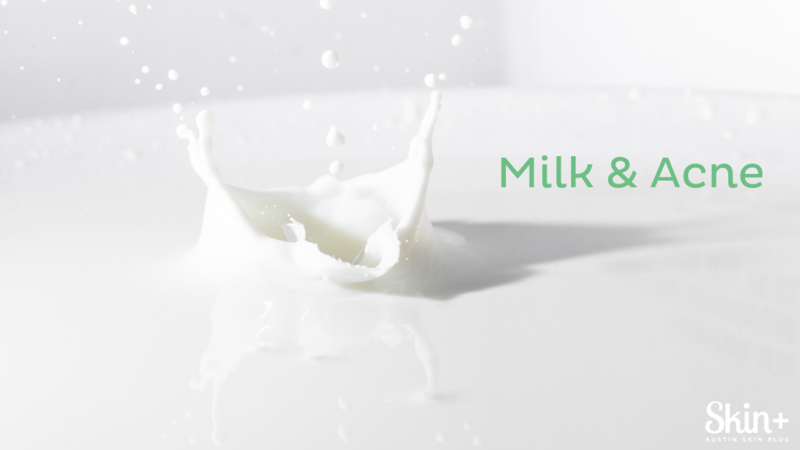 Austin Skin Plus | Could Milk Be Making Your Skin Worse? Could Milk Be Making Your Skin Worse? If you suffer from acne, while a targeted skincare routine may be able to significantly reduce breakouts, it is always a good idea to analyze your diet. Every skin type is different and reacts differently to environmental factors. However, for many acne sufferers diet plays a huge roll, especially when it comes to the consumption of dairy products. Milk contains Insulin Growth Factor 1 (IGF-1), which is a hormone that is similar to insulin. IGF-1 can confuse the hormones present in our bodies and cause acne breakouts by increasing the growth of sebaceous glands, inducing hyperkeratosis, etc. Our bodies work hard to self-regulate hormone levels, which are always ebbing and flowing. When we introduce certain foods into our diet, like milk, we can easily offset our delicate hormonal balance, which can have all kinds of ramifications. In addition, for some people, the lactose in dairy is generally difficult to digest so you may find that even if it doesn’t cure your acne, you have more energy, better digestion, and a healthier gut. If you are breaking out and have never tried an elimination diet, it’s worth considering. At Austin Skin+, we include a dietary evaluation in your consultation….ensuring the best overview of getting your skin into glow-mode!